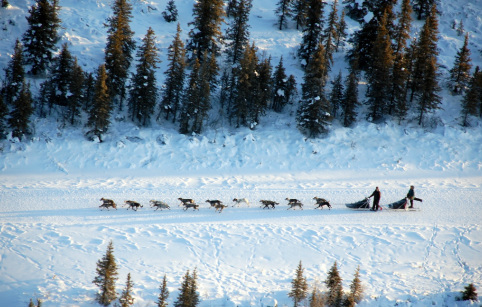 A two-sled team takes to the trail during the Denali Double dog sled race. Photo courtesy Denali Doubles. Sitting around the table during a recent Mat-Su Convention & Visitors Bureau board retreat, the "smack talk" began between the two newest board members, Zack Steer and Travis Taylor. Both will be racing against each other in an upcoming dog race, and both were quick to point out they plan on being in front of the pack. On the surface, it appears to be a mismatch - Steer is a seasoned Iditarod musher, finishing as high as third in 2007. He owns Sheep Mountain Lodge, and has run dogs for several years. Taylor, on the other hand, lives in the city and got on a competitive dog sled for the first time about a month ago. Surely, Taylor has no chance right? Not so fast. They are competing in the Denali Doubles Invitational dog race, which starts in Cantwell on Feb. 13. The Denali Doubles isn&apos;t exactly your routine dog race though - teams are comprised of a pro and an amateur, with 20 dogs pulling the two-sled teams 265 miles, from Cantwell to Paxson and back to Cantwell. It attracts some of the biggest names in dog mushing, including Lance Mackey, Paul Gebhardt and Tim Osmar. And, of course, people like Travis Taylor. The pros all must have finished in the top 5 of a major dog race, or won a humanitarian award or finished as the rookie of the year to qualify for the Denali Doubles Invitational. The amateurs, on the other hand, must have a sense of adventure. The race allows seasoned veterans to evaluate their teams on an extended run, so they can put together their Iditarod teams for the March race. In the famous Iditarod, mushers start with 16 dogs, as opposed to 20 in the Denali Doubles, and obviously only one sled and musher. Taylor will be mushing with Mike Santos, while Steer is teaming up with Alex Beutow. So who will lead their teams to the front of the pack? We love Zack, but as someone who wouldn&apos;t know a wheel dog from a leader, it&apos;d be nice to see the "new guy" earn some bragging rights.